For the Vertical Cinema project we ‘abandoned’ traditional cinema formats, opting instead for cinematic experiments that are designed for projection in a tall, narrow space. It is not an invitation to leave cinemas – which have been radically transformed over the past decade according to the diktat of the commercial film market – but a provocation to expand the image onto a new axis. This project re-thinks the actual projection space and returns it to the filmmakers. It proposes a future for filmmaking rather than a pessimistic debate over the alleged death of film. 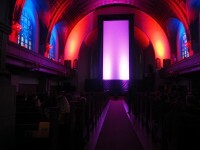 Vertical Cinema is a series of fourteen commissioned large-scale, site-specific works by internationally renowned experimental filmmakers and audiovisual artists, which will be presented on 35 mm celluloid and projected vertically with a custom-built projector in vertical cinemascope. 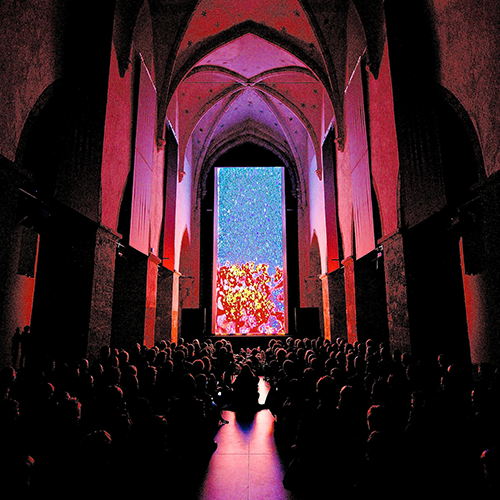 The programme is made solely for projection on a monumental vertical screen that was first upended in 2013 at Kontraste Festival in Krems, Austria. Four newly commissioned films premiered at the opening evening of Sonic Acts Festival 2017 in Amsterdam. Vertical Cinema features works by Tina Frank (AT), Björn Kämmerer (DE/AT), Manuel Knapp (AT), Johann Lurf (AT), Joost Rekveld (NL), Rosa Menkman (NL), Billy Roisz (AT) & Dieter Kovačič (AT), Makino Takashi (JP) & Telcosystems (NL), Esther Urlus (NL), Martijn van Boven (NL) & Gert-Jan Prins (NL), Susan Schuppli (UK), Lukas Marxt (AT), HC Gilje (NO), BJ Nilsen (SE) & Karl Lemieux (CA). These fourteen experimental films are screened live on a vertical monument, a monolith, are a unique blend of abstract cinema, structural experiments, found footage remixes, chemical film explorations and live laser action. The artists offer their view of ‘vertical axis art’, and the results of this challenging commission are fascinating.